Lately, I’ve been craving French Onion Soup. That may be because the weather has finally cooled and there is a distinctive fall feel in the air. 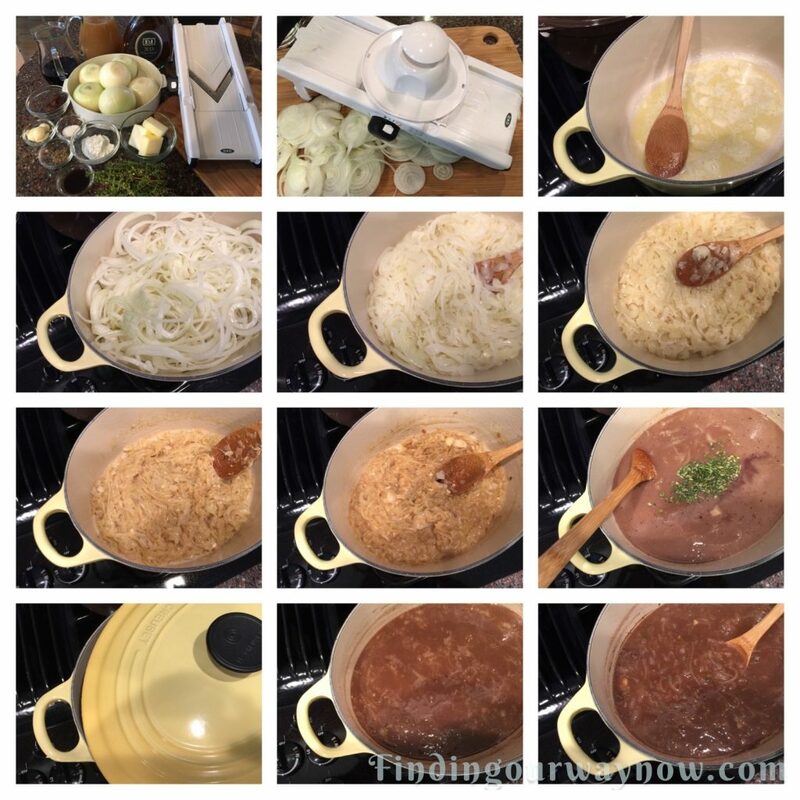 To satisfy that craving, I decided to make my very flavorful, full-bodied French Onion Soup recipe. 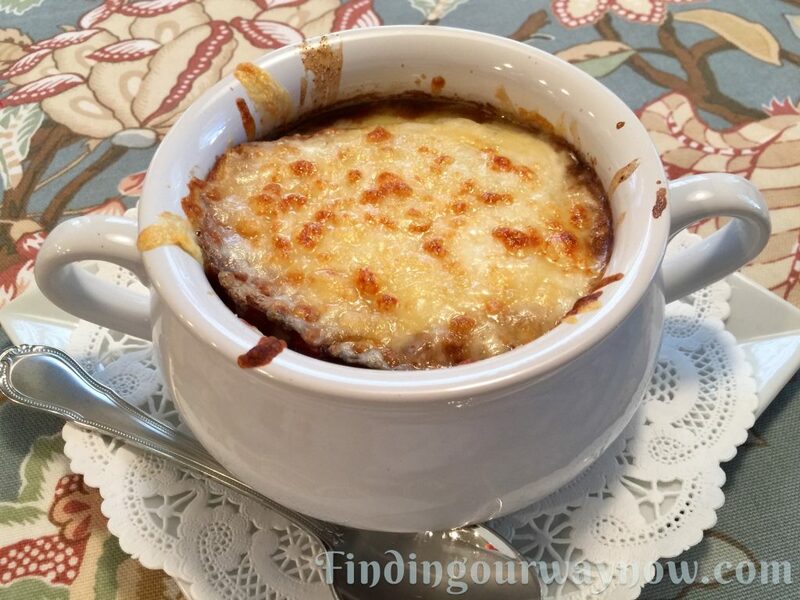 My French Onion Soup recipe came about after a few disasters, lots and lots of onions, many trials, and errors, and finally a result we all loved. It’s not very hard to make, but it does take some patience and time. Regardless, the result is so worth the effort. Ingredients: Makes approximately 4 to 6 entree size servings (or 8 to 10 starter size servings). Clean, prepare and slice the onions. Using a large Dutch oven or heavy cast-iron stockpot, melt the butter and sauté the garlic until translucent. Add the onions and mix until they are coated with the melted butter. Cook on medium-low heat for about an hour or until golden brown and caramelized. Stir occasionally to prevent the onions from sticking. Once the onions have caramelized, add a small amount of beef stock to the onion mixture and stir to deglaze the pan. In a small bowl, whisk the cornstarch, beef bouillon, Worcestershire sauce with a ½ cup of the beef stock until all the ingredients are thoroughly blended. Pour the mixture over the caramelized onions. Add the remaining beef stock, wine, brandy, thyme, salt, and pepper to the onion mixture and stir until incorporated. Bring the mixture to a simmer and cook, partially covered, for about 30 to 35 minutes. Stir occasionally or as needed. To Serve: Warm 4 to 6 large soup bowls. Toast the bread slices in a toaster or oven until medium browned. Shred or grate the two kinds of cheese and blend together. Turn on the oven broiler. Ladle a portion of the soup into each bowl leaving room for the toasted bread slices. Place the toast on top, and sprinkle a portion of the cheese on top and around the toasted bread. Place the filled bowls under the broiler and cook until the cheese starts to bubble and brown a bit. If desired, garnish with a sprig of thyme and serve. Notes: Leftover French Onion Soup is better the next day. It also freezes very well. Because of that, I’ll often make a larger quantity. The type of onion you use will make a difference. A sweeter yellow onion makes for a milder flavor; the easy to find yellow onion will give the flavor gives the soup it a bit of lift, one I happen to like best. The cheeses you use are to your taste. I’ve used a mozzarella and Gruyère combination because I like the way they complement the soup. The beef “Better Than Bouillon” ads a ton of flavor so don’t even consider a substitute or omitting it altogether. If you can’t find fresh thyme, you may substitute a teaspoon of dried thyme in its place. 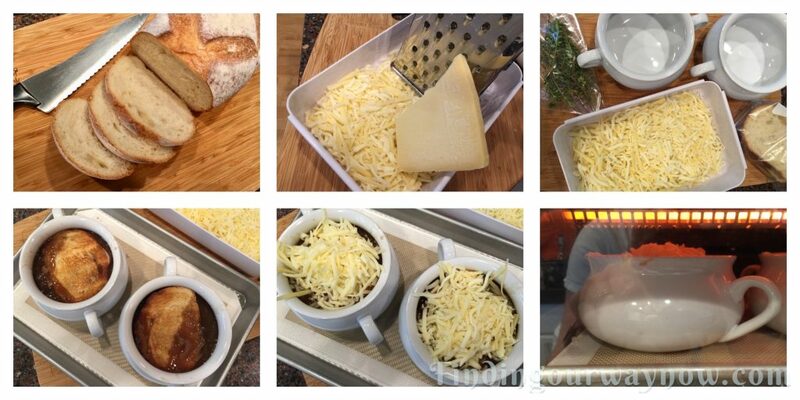 One more thing, if you are looking for a small side dish just reduce the bowl size, the bread, and cheese quantity and serve it accordingly. As stated above, it will make approximately 8 to 10 side serving. The warm, rich flavor of this French Onion Soup with the melted cheese and cheese crouton is irresistible. All you need is a simple salad with a nice bottle of red wine to complete the meal. Enjoy.